Indispensable nutritional counter for anyone watching their salt intake. 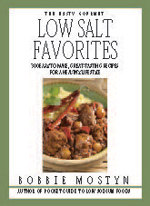 Only lists low-sodium brands and best fast-food choices. All you need to make wise food choices at the store or dining out. 300 easy-to-make, great-tasting low-salt recipes for a healthy lifestyle. Sure to please everyone without spending lots of time in the kitchen. Most recipes are low in fat and cholesterol, and sugar-free.